If you are looking for a great foliage plant for a shaded position, then Ligularia reniformis commonly called the ‘tractor seat plant’ is one to consider. 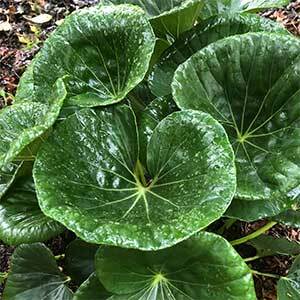 Also known as Farfugium japonicum Giganteum and widely seen as Ligularia ‘Designer Verde’, you could well describe this perennial as a feature plant or a designer plant, however it is really the texture of the large glossy leaves that best describe its attraction. This is a clump forming perennial, evergreen in temperate climates, however in colder climates it will die back over winter. This is a plant that can reach 70cm to 1 metre in height, it can be grown in a container in shaded courtyard if desired. Light shade and a well drained humus rich soil along with some moisture are the main requirements. Prepare the soil well by digging in good amounts of well rotted compost and aged cow or sheep manure. Plant in spring as the weather warms up or in late summer. Water in summer during long dry periods, however do not allow the soil to become wet and soggy. Every 3 – 4 years it is best to dig and divide the plant for optimal growth. Deadheading after flowering is all that is usually required. Botanical Name – Ligularia reniformis, Syn. Ligularia giganteum, Ligularia tussilaginea, Farfugium japonicum var. giganteum, Farfugium reniforme. Spread – will form a clump to around .5m. Position – Dappled shade to shade. Foliage – Large glossy green. Ligularia reniformis is available for sale from the following nurseries.